Following the gruesome and untimely death of Ghana's rising star Ebony, there has being a lot of theories, misconceptions and misinterpretations about what exactly led to her accident this past Thursday, the 8th of February, 2018. Key amongst some of these issues were the prophecies from famous prophets and of course an ambiguous tweet from Nana Appiah Mensah, the C.E.O of Zylofon Media, which was misconstrued to have being in connection with Ebony's welfare before her death. After a public outcry from industry insiders, fans and social media critiques, the 'darling boy' of Ghana's showbiz and creative arts industry was forced to clear the doubts. 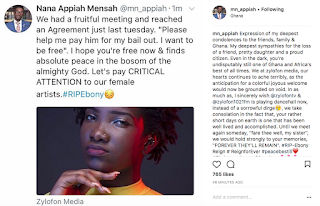 Nana Appiah Mensah made an adjoining statement via his social media account denying all the popular opinions that inidcated the C. E. O tried to sabotage Ebony from her record label. In order to reveal the actual intention behind this ambiguous tweet, the C.E.O was contacted via a phone-in session on Zylofon FM's flagship morning show 'ShowBiz Agenda' facilitated by Sammy Flex. The C.E.O divulged his actual intentions where he stated that, there were no ill concepts behind his tweet; it was a harmless condolence message to the bereaved and not anything personal directed to Bullet (Ebony's Manager). As a matter of fact, he revealed to the panel and audience the show that, strategies were underway to cement Ebony's unprecedented contribution to the music industry and to celebrate a reign which was rather short but happily lived. Among the hints he gave included, a monument of Ebony where people can go visit anytime or any facility that can be named after her.